There can’t be too many people now who don’t acknowledge that our beloved industry is changing. But I think most of them don’t seem to realize that it was ever thus. When I started out in the warehouse at Cambridge University Press in 1965, the experience was (I always thought) like being back in the Victorian book trade. Of course my perspective was immense: one or two months! — so clearly I had no knowledge of the changes which had taken place in the previous twenty years, let alone the first half of the century. What I can attest to is that since that time change has been constant, and appears to be accelerating. Of course the acceleration may just be an artifact of the aging brain: everyone seems to think that that’s what’s going on though. We all tend to assume that the world we see is the world as it has always been. Stephen Page, chief executive of Faber & Faber, has a think-piece on The Bookseller blog which makes many good points, and I think slides over a few problems too. He identifies the “book trade” as publishers’ natural partner in confronting our changing world. Political correctness of course demands that he say this, but in reality, the world is no longer quite what it was. Maybe the days of the retail bookstore are numbered: I predicted just the other day that we would begin to see publishers opening showrooms/retail outlets in Manhattan in order to have a place where their customers could actually see and feel the product. The model where we overproduce too many titles and cram them into the retail channel, only to accept most back later as returns, is clearly dysfunctional. Page goes on “Few other industries are mad enough to try to perfect hundreds of different new products all at once.” This may be true, though there are others, for example the music business. Of course that’s not a particularly great example nowadays. But the trouble is not that we publishers are foolish enough to try and bring too many products to the market at the same time, and that we’d do better concentrating of half a dozen at a time. No, books are not like airliners: you can’t get people to pay thousands of dollars for one. Sure, we could charge more, or more accurately, if we hadn’t passed up the chance years ago and gifted all our technology-derived cost savings to our customers, books could be more expensive today without any of our customers having noticed the upward drift. But they don’t cost more, and anyway they could never cost enough (nor could we ever sell enough copies) that any large publishing business could be viable on just a few titles per year. [I acknowledge that there are counter examples. For instance, I did once know the guy who was responsible for getting out the Merck Manual every year, and this was (I think) the only book he published. But it sold an immense quantity to a captive audience at a high price. This is not a real option for the likes of F&F.] Publishing fewer titles better, which is a rallying cry one has often heard, is probably the right way to go, but also demands smaller publishing companies, employing fewer people, at lower salaries. Page writes “Digital publishing and digital printing also enable us to ensure availability and create inventory for far more titles than in the litho world. Global networks of digital printing and formats are enabling us to create much greater access to our copyrights. So print will remain a major part of our world, but in differing ways.” Sort of OK, but any assumption (which many others make) that we can just dip in and out of printing is wrong. Printing is a capital-intensive industry, and any thought that book manufacturers are just going to sit around waiting for the next order from the publisher is way off. If they can’t keep working at full capacity, they will either find other things to print, or shut up shop. Publishing your books as e-books, and occasionally, when it suits you, running off an edition in print, is not an option. Page isn’t actually saying this — his idea that a physical book could whenever needed by knocked out by digital print-on-demand technology is viable — but others assume that they’ll be able to restock their warehouses on an intermittent basis. They won’t — at least not at a price which anyone today would regard as reasonable. Selling direct to the ultimate customer seems a good option (see my earlier post) but of course it does carry with it the harsh implication that we would thereby be hammering another nail into the coffin of bricks and mortar book selling. We all love bookstores, and will regret their passing, but if it’s a choice between going out of business and being fair to bookstores, not many publishers are ultimately going to hesitate. The weapons available to the retail book trade are unfortunately few. Here’s a warning from Britain, in The Bookseller on 3 March. This rather sane piece from Publishing Perspectives on March 17th makes the case for direct selling quite forcefully. Mike Shatzkin has a lengthy post on why publishers need to engage with their customers which is full of good sense and ideas. Will Penguin Random House offer subscriptions? Joe Esposito at The Scholarly Kitchen highlights the need to define what we mean when we talk about this pricing model. In the course of his article he references a 2011 post on subscription pricing focussing on Penguin Classics. 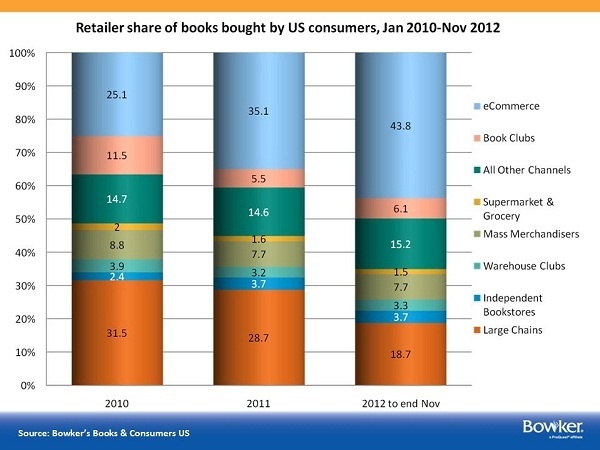 This Bowker chart, copied from Jane Friedman’s blog post “5 valuable charts that show how publishing is changing” highlights the trends in retailing. How long does it have to go on before the column is all pale blue? I do believe publishing will survive as a category, but in vastly different form. Self-publishing will take over parts of the market, but there will still be a business called book publishing and many self publishers will continue to seek to move over the dividing line into that business. Book publishing will consist of hundreds of small, focussed operations, specializing in a particular genre or subject area. It won’t employ people like me who know how to prepare a manuscript for typesetting and can then get it printed and bound, and delivered to the warehouse. It won’t have sales reps selling to bookstores, because there won’t be stores for them to sell to. It won’t even have warehouses. It will have editorial, rights departments, finance and accounts, and most importantly data gathering and analysis, customer service, and e-marketing.